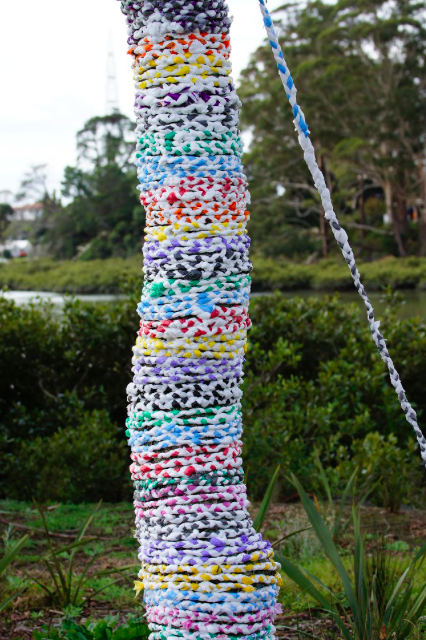 John Johnston's ongoing Enough Rope project consists of a constantly growing (300 metres at Splore) length of multicoloured, handmade plastic rope. The rope is being braided from repurposed, single-use soft plastic. The Rope will coil around the trunk of a tree, and spiral up around branches high up into the tree. Enough Rope is a visually festive celebration of reuse, but the ongoing production of the plastic rope also reminds us of the seemingly endless production of single-use plastic. The project highlights the need to continue phasing it out. John Johnston is a Tāmaki Makaurau-based visual artist. The shared goal of ecological sustainability is a primary concern of current work. John has exhibited work in a variety of media throughout Aotearoa and Australia. He holds a Master of Visual Arts from Sydney College of the Arts, and a Bachelor of Fine Arts with Honours from the Canterbury (Ilam) School of Fine Arts.